Of course the Jews in Palestine were under ‘occupation’ from about the time of Nebuchadnezzar until 1948. During the period of Turkish and British rule from about 1890 until independence, they created the institutions of a new Jewish commonwealth, everything from health funds to road-building companies to labor unions to universities to collective farms to kindergartens to newspapers to an army. They had some help from international Jewry, but it was small potatoes. Most of what they built was bootstrapped into existence, often — as in the reclamation of previously worthless land purchased dearly — at great human cost. The Palestinian Arabs, on the other hand, are the greatest recipients of international aid in the history of the world. Billions and billions of dollars have been showered on them to help them create economic, social and political institutions that could be a precursor to statehood. They have political autonomy — total control in Gaza, and civil self-rule over 97% of the Arab population of Judea and Samaria. Yet they have not been able to create a functional economy in either the PA or Hamas-controlled areas. Criminality and corruption characterize their regimes. Cronies of the rulers control monopolies in telecommunications, building materials, etc. Erekat is not entirely wrong when he says that ‘occupation’ — such things as Israeli border controls which deny Palestinian Arabs access to Israel, checkpoints on major roads within PA areas — does have a stifling effect on commerce. But there are things that have held Israel back, too. The continuous pressure of terrorism and the need for security in every aspect of Israeli life, for one, and the periodic wars and time and energy devoted to reserve duty between them, for another. Unfortunately, that’s been tried, with Gaza. We know the result: so far this month, 23 rockets have landed in southern Israel. There is no reason to think a withdrawal from Judea and Samaria would have different results (except that it would be easier to hit Israel’s population centers). In fact, it insults the Palestinian Arabs to assume that they are lying when they tell us that their greatest desire, the goal to which they aspire every day more than any other, is to get rid of the Jews on what they believe is their land. Why shouldn’t we take them at their word? Now we are perhaps in a position to understand Romney’s comments about culture. The Israeli Jewish culture yearned for a homeland in the land of Israel. Was this necessarily inconsistent with justice for Arabs in the region? No — but it was inconsistent with Arab culture, which has always insisted that any Jewish sovereignty is unacceptable. This principle has become the foundation of Arab ideology. It’s been nurtured through the years by ceaseless propaganda in media, educational and religious institutions, as well as by concrete actions, such as preventing the repatriation of Arab refugees and their descendents to anywhere but ‘Palestine’. So today there is a Palestinian culture which defines itself by opposition to Israel and Jews. Its heroes are Arabs who kill Jews (we call them terrorists) because that is the culture’s highest value. It can express itself in religious terms, as in the Hamas charter‘s inclusion of a Islamic injunction to kill Jews “wherever you find them,” or in pan-Arab or Palestinian nationalist ones. There is also a combination of anti-Jewish tropes from the Quran with modern European Jew hatred, some of it imported directly from Nazi Germany by the Mufti of Jerusalem, that has been introduced to spice things up. 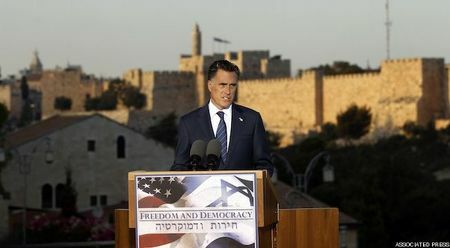 Funny that Erekat thought to call Romney’s remark ‘racist’. What could he have been thinking? So that is what is relevant about Palestinian culture. Building an economy and a state is hard work. You can’t do it if you are mainly focused on hating and destroying someone else’s. This entry was posted on Tuesday, July 31st, 2012 at 3:20 pm and is filed under General. You can follow any responses to this entry through the RSS 2.0 feed. Both comments and pings are currently closed. The Palestinian Arabs have no desire to build a state. They expect others to do it for them. And then they have the chutzpah to accuse others of “racism” when they don’t! No people on earth has been more blessed than them but they treat the blessings others have bestowed on them with absolute contempt. If they are where they are today, that’s certainly not Israel’s fault. I agree completely with the remarks made about the political elements of the Palestinian culture i.e. the focus on destroying us rather than on building something for themselves. But I would also not gloat so much about our present situation despite our historical accomplishments. The fact is that the ideal of an independent Jewish state in which Jews do all the work including the hard physical work is not a reality. In Israeli society those who do the low- paying jobs are ordinarily Palestinian Arabs or guest- workers many of whom become more than guests. This too raises the question of possible hostile elements in key positions within the Economy. A great response Vic, and while I agree with the totality of what’s written here, I must agree as well with Mr. Freedman. We stopped having “Avodah Ivrit” after 1967, and it has bothered me ever since. Things will never be right again until it’s Jews who are not only building our homes(! ), but also cleaning our streets. Good article, as usual, Vic. Well, Romney might not have been your first choice or mine for the GOP nomination, but you gotta admit one thing: There’s no way Obama would have said anything like what Romney just did. No way. And even that speaks volumes.